If you regularly read my posts on Feeling Stitchy -and why wouldn't you? 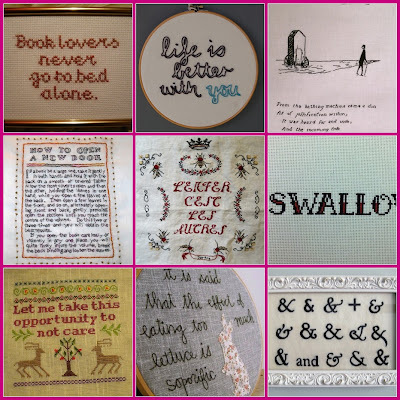 ;) - you will probably have noticed that I LOVE embroidered and cross stitched lettering. From clever and witty quotes to beautifully stitched Ampersands. So if you are equally enchanted by Stitched Lettering come and join me in the Flickr Group I started earlier today! You can post (hand) stitched lettering, alphabets, ampersands, text, quotes, patterns of lettering, monograms etc etc you get the idea....There are already many wonderful photos posted in the group. I hope this new group will be a source of inspiration for you all! P.s. click on the links underneath the photo to learn who the stitchers of these awesome pieces are! Thanks for sharing about the Flickr account. I'm heading over there now. Love all that you do! Awesome group and awesome collage!!! Seriously. A great pool of inspiration. Thanks for creating it. You could not be cooler.